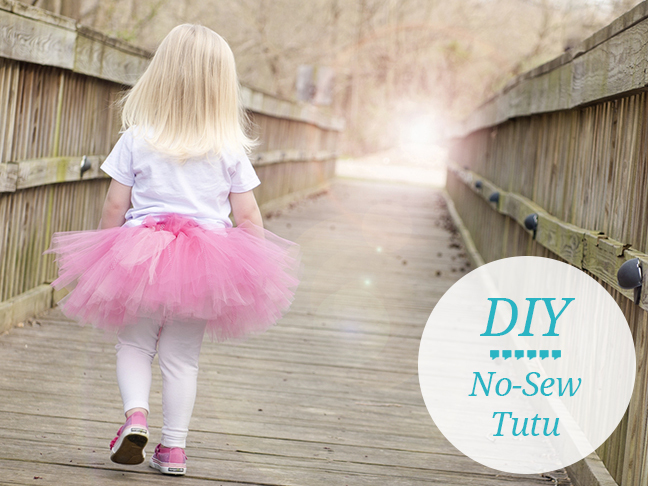 If you're looking for tutus in unique colors, you might just be better off heading to the fabric store for the tulle of your choice and making a no sew tutu on your own. Best of all, this DIY tutorial requires no sewing at all. CraftyGuides.com shows us how. Hi this is Mariana from craftyguides.com. For supplies you're going to need a rotary cutter. If you're on a strict budget you can cut your tulle using a great pair of fabric scissors. You're going to need your self healing cutting mat whcih will help protect your blade and tabletop. I like using the largest mat available, which I believe is a 24×36 inch mat.You can start off with something much smaller. And you're also going to need a Quilters Lip Edge Ruler- which is a ruler that provides enough weight to keep your tool in place and it also sits against the mat to give you even measurements. And of course your main ingredient: tulle! And in this tutorial I will show you how to use a spool of tulle instead of the tulle from the bolt that you purchase by the yard. It's already cut in to 6 inch strips and all you need to do is cut down the length. Multiple the desired tutu length x two plus 1, to compensate for the knot you'll be making later. I'll be measuring out 11 inches, and multiply that by 2, which gives me 22 inches and then I'm adding another inch for the knot. So I'm going to be making my cut right here. Place your Quilters lip edge ruler on to your mat. I'm also rolling these two rolls on top of each other and it saves me some time. You roll it across your layer using the lip edge ruler as your guide. these are already on top of each other so all you have to do is roll. Make sure they meet at the one inch mark and make your cut. Continue cutting strips…an average single layer tutu for a baby/toddler will use between 40-60 strips. For supplies you will need: scissors, a ruler, some needle and thread and non-roll elastic. I've precut mine. (Precut to child's waist size minus 2" to allow for a snug fit. It measures out to 18 inches. I originally measured 20 inches on my daughters waist and I'm subtracting 2 inches. This will give the tutu a snug fit. Plus the elastic will stretch a bit while tying the strips on. If you were to start with your original measurement, the tutu, the waist would stretch out past that measurement and it would just be too big for your daughter. And have the edges overlap about a inch, and then just continue [sewing] up and down as much as you can. Finish sewing and cut excess thread off…make sure its secure by pulling the elastic. For supplies you'll need your precut tulle strips and your sewn elastic waistband. You can tie your strips on to the elastic however it might be easier to have something round to attach the elastic to. A paper towel roll will be perfect! As you tie your tulle strips to your elastic waistband it'll start to become loose. So what you need to do is take one of these straight pins and pin it through to keep it in place. You might also have to fold it as it starts to become loose and just pin it in place in the areas you need. And if you dont have a paper towel holder you can just place the paper towl roll inbetween your knees and work. So take your strip and bring one end over and behind the elastic like so, the other end should come over the front. Measure it out to make sure that the ends meet. Using the end thats on top, bring it under the bottom strip and back up to make your first knot. As youre tying your strip you can see the top one is beginning to become shorter, youll have to adjust it as you start to tie to make sure that they both meet. Taking that same strip you make another knot and tie and doing the same thing you make sure that the ends are meeting. And as you get to the top this is what your knot should look like, you can flare out the ends just by pulling them. This also makes it a little fuller and makes it lay evenly on top of each other. Thats what your double knot should look like. You can continue by repeating the process. Take the edges and kind of pull them to the side. And to make sure you're not tying it too tight bring the tip of your pinky towards the back and make sure that you're able ot do that- thats how you know if you're tying it tight or not. If you do tie it too tight it starts to flatten like this, it starts to fit a little wierd and it also starts to stretch out the elastic. And then you can also shift the knot toward the top and that kind of gives it a more fuller look as all the strips are tied on. The knots in this technique to me looks a lot neater, however some tutu makers feel that the double knot technique produces fuller tutus. So you fold your strip in half like so, create a loop up top. Bring it behind the elastic, take both ends of the folded strip, make sure they line up with each other, bring it through the loop and then you pull. and im adjusting the length because its slightly uneven so im just kind of pulling on that. Bring it behind the elastic waistband and take your two ends, make sure they're even and bring it through the loop, pull down. Now let me show you- here you got your double knots and here goes your slip knots. Either way you're going to get a beautiful tutu. Continue tying until you reach desired fullness (between 40-60 strips).